Click here to purchase a PICK-QUICK Gift & Loyalty Card online. Click here to view your PICK-QUICK Gift & Loyalty Card balance online. 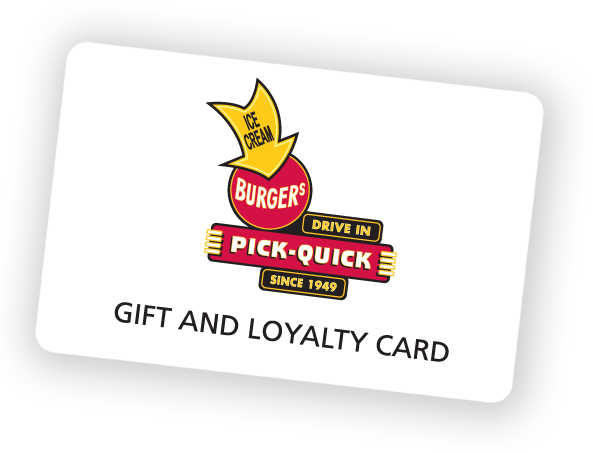 PICK-QUICK’s Gift Card program is available for purchase, reload, and redemption at PICK-QUICK Auburn and SoDo*. PICK-QUICK’s Loyalty program currently rewards you with $10 for every $100 spent at PICK-QUICK Auburn and SoDo. *Please note that PICK-QUICK Fife is not currently able to accept Gift & Loyalty cards. Our Cold Standard Vanilla ice cream perfectly blended with Caramel sauce and crushed Almond Roca Candy. Cold Standard Vanilla ice cream layered with Blackberry topping, then finished off with whipped cream and a cherry. DELUXE Double Tillamook Cheeseburger, French Fries & Medium Soft Drink. DELUXE 1/4 lb. Hot Dog, French Fries & Medium Soft Drink.